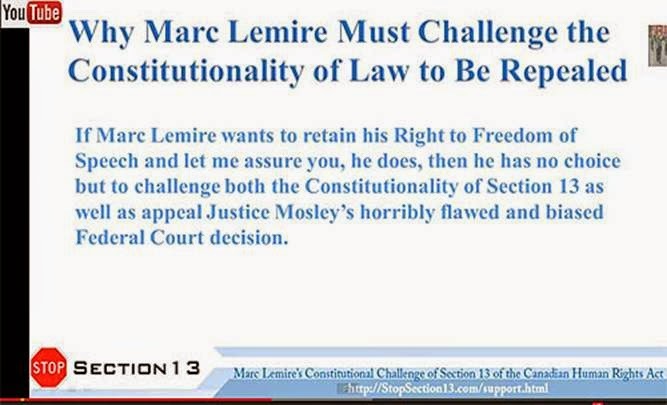 The FreedomSite Blog: Support Marc Lemire's Freedom of Speech Legal Defense Fund to Strike Down Section 13: "Why Marc Lemire Must Challenge Constitutionality of A Law That May Be Repealed"
Support Marc Lemire's Freedom of Speech Legal Defense Fund to Strike Down Section 13: "Why Marc Lemire Must Challenge Constitutionality of A Law That May Be Repealed"
If Freedom of Speech is important to you, and you believe The Truth Is A Defense to a human rights act complaint (despite what our human rights industry “allows”) then please donate to Marc Lemire’s Legal Defense Fund. If you would prefer to donate online, please send your donation via PayPal, or send an Interac Money Transfer. Thank you for everything you do to defend our God-given Rights and Freedom! 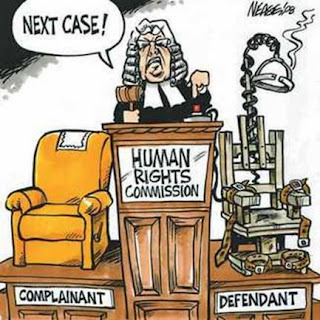 I think it is horrific that, based on the allegation of one man with perennially hurt feelings, Richard Warman, the Canadian government’s prosecution of you for a “human rights violation” is now in its 9th year. I know you removed all articles and documents Mr. Warman complained about almost immediately upon hearing of his complaint, yet the CHRC has refused to agree to mediation or order conciliation at every turn. This is not the actions of a “remedial” law; this is persecution pure and simple. What astounds me is that the one item on which our Canadian Internet Censors, aka Canadian Human Rights Tribunal, convicted you for was the posting of a document on your website that you did not even write and that only 7 people in Canada ever even saw! The very least I can do is help you defend yourself against this abuse from our government; to make sure your Constitutional Challenge of Section 13 of the Canadian Human Rights Act is successful so no other Canadian will suffer this unconstitutional persecution by those who would censor Free Speech on the Internet. I know that without my support and the support of my friends and family, your Constitutional Challenge to strike down Section 13 of the Canadian Human Rights Act will be difficult, at best, so please find enclosed my generous donation, payable to Marc Lemire, to help you continue the fight for our Right to Freedom of Speech. 8. The Senate of Canada still has not repealed Section 13 even though Bill C-304 has been in their hands for almost a year. They may never pass Bill C-304 into law so we must continue the fight for Freedom of Speech in the courts. Is it “remedial” to refuse any and all attempts at mediation?Is it “remedial” to refuse any and all attempts at mediation?